Many thanks again to Anthony Watts for the opportunity to Guest Post at WUWT. There were a lot of great comments on my hypothesis that geothermal sources where the basis for the ENSO. Many who support the conventional wisdom said there was no proof of connections between ENSO cycles and earthquakes, etc. A valid point I was going to try and tackle. But I also received lots of links in the comments section to others with the same theory – and with far more work behind them. When I looked into what has been done by others, I ran across an incredibly detailed analysis that answers most of the critics challenges. Before we get to the study, lets review more background information. The Galapagos hotspot has a very complicated tectonic setting. It is located very close to the spreading ridge between the Cocos and Nazca plates; the hotspot interacts with both plates and the spreading ridge over the last twenty million years as the relative location of the hotspot in relation to the plates has varied. Based on similar seismic velocity gradients of the lavas of the Carnegie, Cocos and Malpelos Ridges there is evidence that the hotspot activity has been the result of a single long mantle melt rather than multiple periods of activity and dormancy. Clearly this area is home to an incredible diversity of geological structures. When reviewing the Cocos Plate material at Wikipedia, I ran across this study (pdf) that documents the history of the region. It is worth a read (its pretty short). In essence this region has it all: subduction zones, spreading zones and a hot spot (which created the Galapagos Islands). So there is no doubt the region is geologically active. Put that one to rest. A new “black smoker” — an undersea mineral chimney emitting hot, iron-darkened water that attracts unusual marine life — has been discovered at about 8,500 feet underwater by an expedition currently exploring a section of volcanic ridge along the Pacific Ocean floor off Costa Rica. Using Jason’s mechanical arms and a temperature probe, they logged water temperatures of 335 degrees Celsius (635 degrees Fahrenheit) at the vent’s opening. In 1986, a large plume of hot, particle laden water approximately one million cubic meters in volume was discovered over the North Cleft segment of the Juan de Fuca Ridge. This plume was unique in its shape (horizontally and vertically symetric), size (100 km3) and rise height (~1km), indicating that an enormous volume of hot water had been released in a relatively short period of time. This hot spot is 125-150 miles (200-240 km) wide! It dwarfs the mega plume referenced above. And it lasted for months, when it was then followed by an even larger plume. I went back to the Argo animation site and counted 14 plumes coming off this area from 2007 to 2012. That’s almost 3 mega plumes a year. And as stated before, it looks like more are coming off the coast of Panama and Peru, but are not being seen until they hit the surface (lack of Argo data in that area). So far no one has explained how these mega plumes are caused by current and wind 100 meters below the surface. And I doubt they ever will. Combining the 1st study linked above for this region to the mega plume work at Juan de Fuca Ridge, we begin to confirm the idea that these plumes are releasing vast amounts of heat into the ocean, which in turn effect the atmosphere (not the other way around). Increased seismic activity along the East Pacific Rise (EPR, Walker, 1988, 1995) and Juan de Fuca (Johnson et, al., 2001) ridges is known to precede increases in hydrothermal venting rates and corresponding SST temperature anomalies. Helium seawater profile data obtained during the World Ocean Circulation Experiment (WOCE) show high concentrations of Helium3 over trenches off the Mexican coast indicating increased hydrothermal venting activity within the trenches (Fig. 9). This particular profile from Pacific Marine Environmental Labs (PMEL) shows the largest anomalies directly over the trenches of the Mid-American Trench. The Galapagos rift just north of the Galapagos Islands has been a subject of study for nearly three decades by several groups (WHOI, PMEL, and RIDGE). This is the site of a documented mantle plume and there were several ongoing integrated site studies on hydrothermal vent systems. 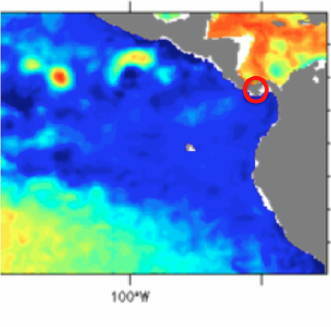 The mega plumes discovered 100 meters down by the Argo data clearly form off the West Coast of Central and South America, and travel westward. And they are produced very regularly (not occasionally). The ocean floor is thin and cracked and we have a very limited understanding of how water and underlying magma interact on various scales. We know less about the deep ocean that we do about the Earth facing side of the Moon. We only discovered Plate Tectonics within my lifetime, hydrothermal vents within my children’s short lifetimes. We are just beginning to explore the ocean’s geological wonders, which cover an area 3 times the size of the land surface of this planet. All that is settled about science today is we still have a lot to learn, and what we know is still dwarfed by what we don’t know. When climate scientists look at the surface temperature of the Earth, rarely do they treat the Earth as having having self-generated warmth of it’s own. As I pointed out at WUWT, the mountain jets coming across Central America are causing localized warming, cooling, and eddies of water. If you look at the surface temperatures you can see the eddies. The 100m temperatures are showing the bottom of eddies which are mixing warm water down from the surface. I have not done frame-by-frame comparison between surface and 100m, but if you try that you might be able to see if there is a surface eddy above the 100m hot spots. I can also see similar movements faintly at 1000m, which implies some deep horizontal eddies rather than vertical plumes because the eddies are moving horizontally more than a vertical plume would tend to. Air cannot do that much warming to that much depth. Physically impossible. But thanks for the link and heads up. I was not aware of that phenomena and love to learn new things (everyday if I am lucky). Yes, obviously most of the ocean is not being warmed to that much depth. But warm water in a small eddy does not require warming all the surrounding water. If my idea is correct, there should be a connection between the deep warm spot an the surface. Predictions are useful. Does the location of the 100m warm spot match the location of a surface eddy, or do the rate of horizontal movements match? I discovered that the Maps option shows each frame of the animation. Going back to 2/25/2009, as shown in your image, shows the same hot spot at 100m. Then click on the Surface option. I certainly didn’t expect a swirl like that. It is a thing of beauty. Here is an animated GIF of the surface and 100m on 02/25/2009. Come to think of it…. is the 100m temperature from an Argo float? Might a float get trapped in an eddy? Especially because I think I see a ghost of the eddy down at 1000m — a float might have been guided down the middle of the eddy, which increases its chances of measuring warmth. I don’t think the Argo floats can get caught in an eddy because they submerge to depth, take readings, then rise to various points to take more readings, then surface to take more readings, and then report their data via satellite. The ocean is filled with known layers of varying temperature (related to salinity I think). Our Naval submarine force has used these for years to hide from eneny sonar. These layers are known predictable, and relatively thin. For a float to become “caught” it would heve to remain at a given depth. Actually, I was thinking about the effects upon a surfaced float which was submerging. Objects in a vortex are drawn to the middle, and as a float submerged it would probably follow the center of the vortex down. But you described the measurements being taken on the way up, which makes sense because the location will be known shortly when the float surfaces. Even if a float follows a vortex down, if it is not measuring then the vortex won’t skew the regional measurements. The floats at depth are probably too deep for a vortex to bother them much. So when they surface they will tend to be sampling the surface randomly, without much effect by near-surface patterns. Surfacing through a vortex might draw them toward the center somewhat, but the float will have chosen the surfacing location based upon deep currents so being centered in, and by, a vortex wont matter much.